Hans Lawaetz, the long-time president of the Virgin Islands Conservation District, was inducted last week into the inductee to the National Association of Conservation Districts Southeast Region Hall of Fame. Lawaetz was recognized along with nine other district representatives from each state in the southeast region during the 2018 National Association of Conservation Districts Summer Conservation Forum in Williamsburg, Virginia, according to the news release from the U.S. Department of Agriculture-Natural Resources Conservation Service. Crucian cattle rancher and businessman, Hans Lawaetz, has been a conservation leader in the USVI for more than 50 years. He owns Annaly Farms Senepol, Inc., and Annaly Farms Market on St. Croix. He helped found the Virgin Islands Conservation District in 1965 and served as its president from 1965 to 1975 and again from 1991 to 2002. He also served on the NACD Board of Directors, was chair of the NACD Education Committee, and an NACD Council member. Lawaetz helped form the Senepol Cattle Breeder’s Association, serving on the board for over 35 years, and now serving as honorary life president. He is presently hosting the 41st Annual Convention of the International Senepol Association on St. Croix with Senepol breeders from seven different countries. Lawaetz was also secretary general of the USVI Olympic Committee for 20 years, president of the organization for 16 years, and now serves as its honorary life president. And he’s president of the St. Croix Friends of Denmark Society. Last November, Gov. Kenneth E. Mapp appointed Lawaetz to the V.I. Hurricane Resiliency Advisory Group to help guide post-hurricane reconstruction efforts. 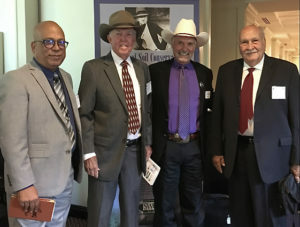 The Hall of Fame recognizes individuals from the nine-state, two-territory Southeast region who have made significant contributions to soil and water conservation to help ensure the proper management of our nation’s natural resources, according to the news release. Each state and territory may nominate one individual for the award each year. The National Association of Conservation Districts was established in 1946 by a group of conservation district officials from across the country. These leaders recognized the need for a unified voice in natural resource conservation and worked tirelessly to ensure that conservation remained at the forefront of U.S. agricultural and environmental policy.